Dream of my life has come true; one of the most memorable & eagerly awaited monsoon rail treks (BTCians were waiting for it from past 10 months and the pleasure on their faces was worth the wait) is how our trip to Dudhsagar was described by super thrilled members of BTC family. Some have even decided to revisit these memories and create some of their own with their partners in future. I was probably too excited about my first trek or too scared of Bangalore traffic to have reached the KR Puram station almost two hours before the scheduled train time. On 2nd thoughts, it must be the story about one of the members missing the train by few seconds on his/her first overnight trek and the subsequent teasing not only by very sympathetic friends but equally supportive BTC family members must have done the trick. All 30 BTCians boarded in KR Puram & Yeshwantpur. As everyone had settled by now, it was time for dinner and a very charming couple in the group gladly shared their food with us. Train reached at Castlerock 1hr late. Everyone got down, packed everything. It was decided to segregate the entire batch into two groups of fast and medium trekkers. The fast trekkers assigned with the task of capturing space for tents at Dudhsagar. Rest of the group has Introduction, Do's & Don't in the event. The group was hardly out of the station before they spotted an old station wall and grabbed the opportunity of posing for the cameras. 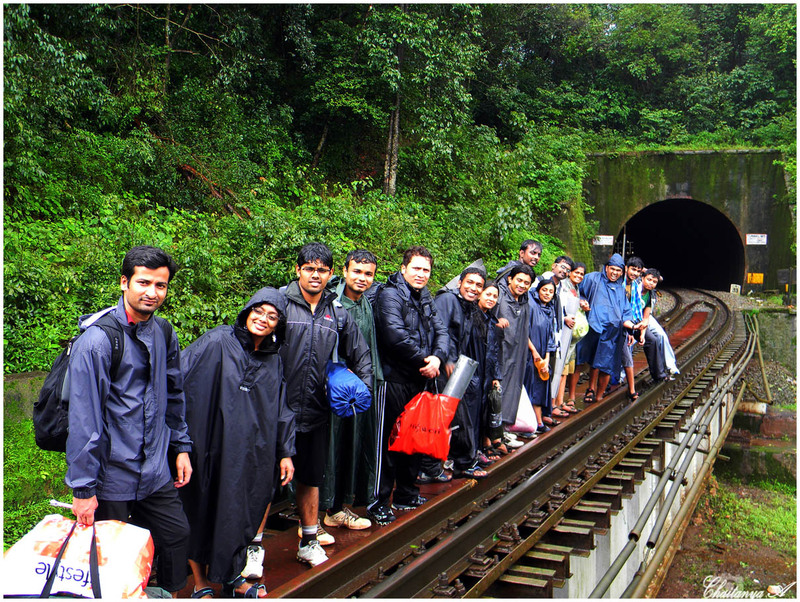 A train and some heavy rains tried to deter the determined photographers and willing models, however to no avail. 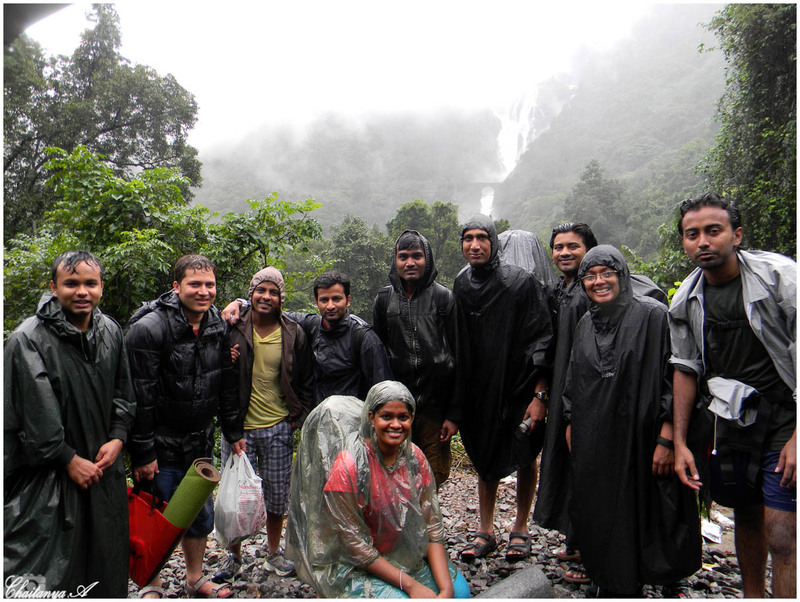 Finally, we started on our path with absolute focus on next 12Kms to Dudhsagar falls. The path was beautiful and it kept inviting us to explore more and more. It was an exhilarating experience to walk through fog/mist covered path of forest, dark tunnels and frequent rain was our constant companion making the journey even more fascinating. 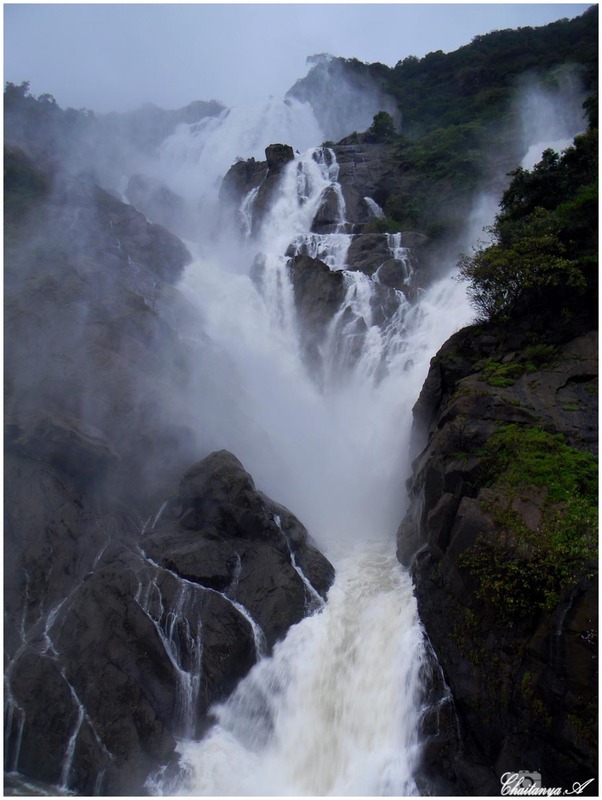 The scenic beauty of my native is as mesmerizing as the path we were navigating and this encouraged me to move faster for 3 reasons- Dudhsagar falls was on my mind, relieve myself of the heavy luggage and last but not the least how soon could this challenge be completed. We had just crossed a tunnel and there was a bridge after the tunnel. Two of us crossed the bridge and were waiting for the third one on the other side. 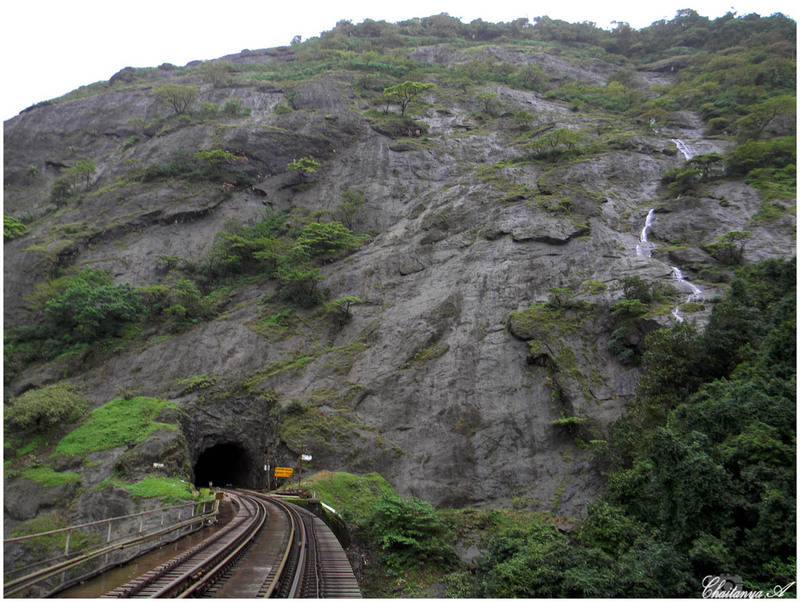 We heard the horn of a train and alerted the person yet to cross the bridge as this person was lost in capturing the beauty of the tunnel and had also decided to capture the moment when train comes out of the tunnel. Until then it was all as per the plan and nothing exciting. Suddenly, he starts running to cross the bridge expecting the train to come out of the tunnel; however the train shows up from opposite direction and was coming towards him at a pretty good pace. We along with an another group of trekkers were screaming our lungs out asking him to get out of the way but he decided to keep running assuming she/he could cross the bridge before the train comes. The train was very close to him/her and luckily the alarm bells went off and he got off the track. We could breathe finally once he was safe on the other side of the bridge and then the devil in me just visualized the whole scene from the beginning until the train had crossed the bridge. It reminded me of the movie “Gulam” where Aamir Khan does something similar and after that I went berserk. I just could not stop laughing and probably the devil in my other trekking partner too kicked in. The sight of the waterfalls board with name of the falls on it did please me; however it was the magnificence of the falls that was breathtaking. It was time for some more photography and sightseeing. We wanted to enjoy all this as much as possible before it got gloomy. We woke up at 5:30 next morning and were expected to start next 10 KM trek to station for 4:30 PM train by 8:00 AM. However, we just could not leave this place without spending some more time in water and grabbed the opportunity when spotted a mini water fall. It was such a refreshing experience and we could feel all the tension easing from our bodies. Finally, it was time to say good bye to this gorgeous place and start our return journey around 9:00 AM. I’m going to cherish these wonderful memories and they definitely have made a lasting impression on me. It was a pleasure being part of this journey and the beautiful people who made it memorable- whether it was the participants or the organizers. A BIG THANK YOU to all the organizers who made arrangements for the trip- whether it was planning, research work, train reservation, tents, cooking tools or first aid. The way they have managed the group is commendable. They were unbelievably meticulous in their planning and execution of the entire event.